1984. For a cute rural-deco 1936 cinema with only one screen and often just one film showing during the week, at any time the Regal’s entrance windows still had eight posters of upcoming movies to scrutinize – as well as others in the front foyer alongside that old-school movie house magnificence that were the lobby cards. I remember Eddie Murphy perched on the bonnet of that red Mercedes in the Beverly Hills Cop, the bare chest of Schwarzenegger teasing The Terminator and the burnt orange skies of Kyle MacLachlan in Dune. But I was always much more interested in the “STEVEN SPIELBERG presents” promise and a partly concealed Mogwai in a cardboard box on the Gremlins poster. When writing Watching Skies, I was acutely aware throughout of the importance of the front cover. Here was a book all about an era of American cinema where the lobby artwork, marquee hoardings and billboard art were vital overtures to the films themselves – and possibly the last flourish of that old-school poster design, technique and placement. The cover had to completely operate in that context. It had to be both homage, future statement and a painterly invite into the world of American ’70s new wave cinema – as well as satisfy modern day publishing requirements, needs and tastes. The punctuation of late ’70s, early ’80s movie posters is a vital and universally cherished graphical grammar pioneered by artists such as John Alvin, Drew Struzan, John Kirby, Bob Peak and Richard Amsel. All are discussed and suitably lauded in Watching Skies – especially the sometimes forgotten Amsel whose posters for one franchise steered their sense of adventure and genre forever more. After being so blessed with the cover art for my previous book, Catching Bullets – Memoirs of a Bond Fan – where the publishers and I were so gifted by a cover that wilfully and rightfully avoided the 007 book clichés of Martinis, girls and guns – the artwork for Skies in turn had a big bar to overcome. 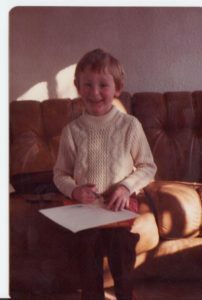 WATCHING SKIES’ Mark O’Connell habitually drawing in the lounge circa 1980. When writing a book you ponder, dream and imagine the cover art from day one. It is no different to wondering what your unborn child will eventually look like. Here is a piece of you and you want and need it to be right. That is only amplified two-fold when you are creating a work looking at an era of cinema so many movie fans and poster art aficionados hold desperately dear. I was also a kid who drew and drew and drew at any given time. My bedroom was full of colouring pencils, pencil shavings, paper books, rulers, felt tips and various ’80s school rubbers which all smelt of plastic strawberries. What started out as crude coloured scenes from my favourite films and shows eventually evolved into making movie posters – for Bond, for Star Wars and for anything I had seen and loved that week. 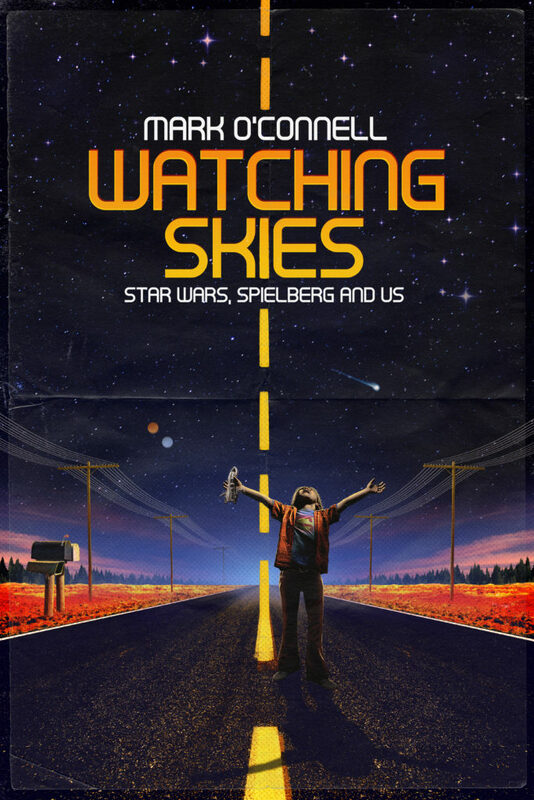 My hunch early on was that the cover for Watching Skies must feel like an early ’80s VHS cover sleeve or a worn quad poster full of adventure, colour and pin marks. Whilst many – if not most – book covers are designed via the publishers themselves, I was fortunate that Watching Skies‘ publishers (The History Press) were open to hearing all thoughts, approaches and design notions. Ultimately and with full kudos to The History Press, I was able to set out to try and find an artist who got that world of VHS covers, torn bedroom posters, folded American quads, pre-Struzan motifs and a sense of adventure and soul. I strongly felt a skilled artist with a love of movie poster art who could turn their hand to a book cover would be the right place to start – instead of a book designer who could echo a movie poster. But that was not before this frustrated movie poster designer endeavoured to have a graphical go himself. And not before I realised that – despite the DNA of the films starring in the book – we could not step on the rights toes of owned elements like X-Wings, TIE fighters, light sabers, motherships and storm-troopers. Whilst it was never the end-intent to use any of my work, this sky kid with a deep love of movie artistry who spent every Saturday morning watching ’80s cartoons whilst creating felt-tipped movie Monets* couldn’t resist having a retro-minded go when the book was originally commissioned (*they were not remotely Monets). Alternative and very early cover art by the author Mark O’Connell remembering a late ’70s world of Helvetica-graced book covers and prime colouring. Next up was possibly one of the best genesis days of the Watching Skies cover. And the most apt. For a book pinned to America, Californian movie masters and that redwood world of E.T. and Return of the Jedi, my next play at the artist’s easel was whilst staying in Russian River, ninety minutes north of San Francisco. Surrounded not only by artist friends and their hive-mind of creativity and colour, I only had to look out the window at the forests and those high Spielberg pine trees to get inspiration when faced with getting some cover ideas down on paper. 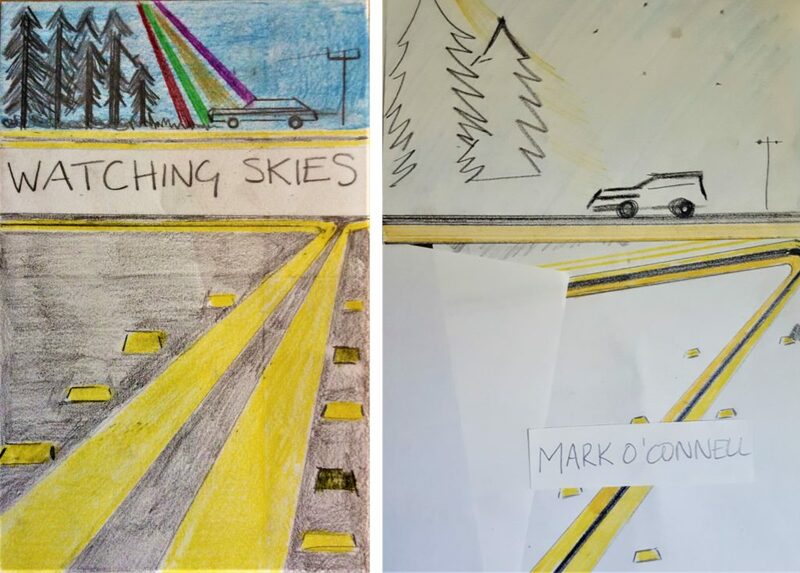 Follow the yellow pencil road… Mark O’Connell’s basic renderings for watching the skies. Naturally, these ideas and fantasy drafts were not going to satisfy publishing and market needs, but curiously this author-art were not wasted efforts. They helped focus thoughts on how to talk to a prospective designer. They helped hone the thinking and what the cover could be. It is often useful when collaborating to know what you don’t want more than what you do. Having trawled the alternative poster art and professional designer webpages and online communities – and being quite taken aback by the sheer volume now of poster talent out there – I quickly settled upon Brit Scott Woolston. A professional designer with a keen movie mind, sense of space and drama – and from the same generation as the book and I – Scott’s rethinking of poster work for An American Werewolf in London and The Thing were easily the clinchers. A designer whose own film art work is recognisable to moviegoers, the ease in which Scott got the brief, understood the brief and designed the brief was sheer brilliance. Scott also understood the current zeitgeist’s obsession with that VHS world of ’80s movies and deliberately side-tracked Watching Skies from the easy Stranger Things influences and flying VCRs. 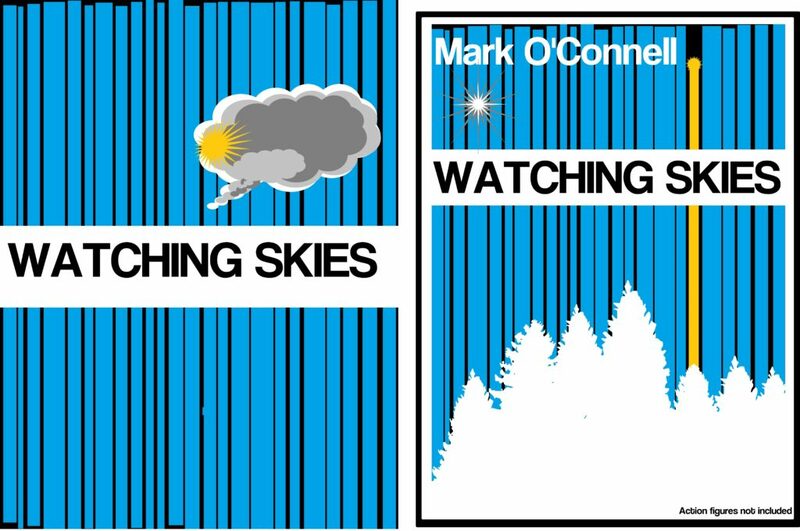 WATCHING SKIES cover – designed by Scott Woolston. Without showing or mentioning any of my own creativity or attempts (I was too embarrassed), the only wish I imparted was a want to somehow keep the yellow line highway motif. What I didn’t expect was such a freshly realised, yet retro minded gem that this author is still bowled over by. 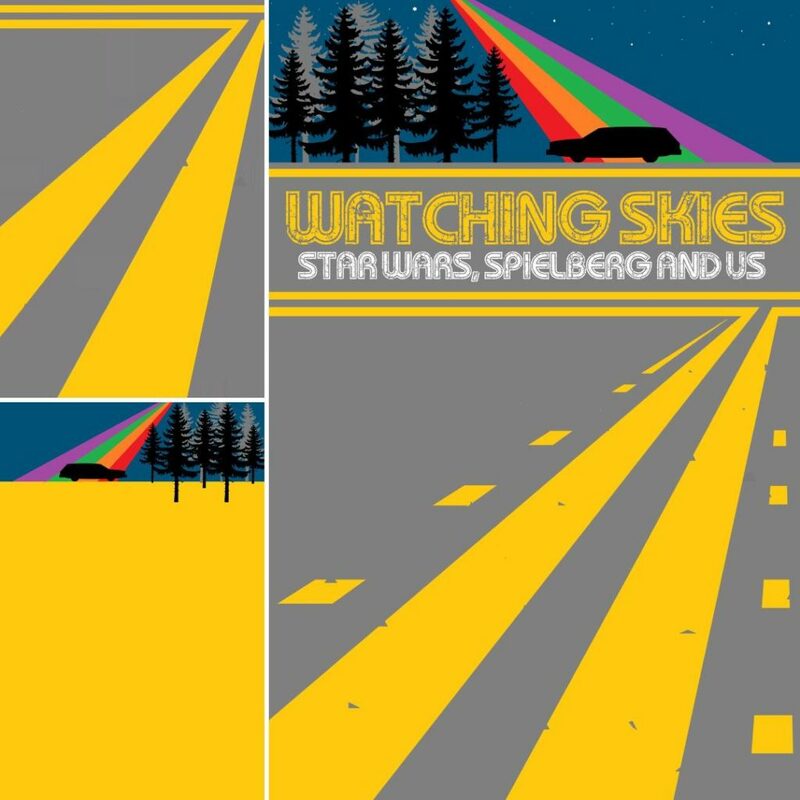 Watching Skies has been blessed with a cover that is instantly recognisable as a late ’70s, early ’80s American movie poster, a soulful reminder of our childhoods, something with character and a history and a piece that stands aside from the writing. That is no mean feat and The History Press and I can only thank Scott Woolston and his graphical magic for not only watching the skies, but reaching way beyond them with something quirky, dramatic and unique. A good book cover should impart what the book is about before it is lifted off the shelf. A great book cover should have a character of its own beyond the writing. With his artwork, Scott Woolston has achieved both. And he didn’t use a coloured pencil once. 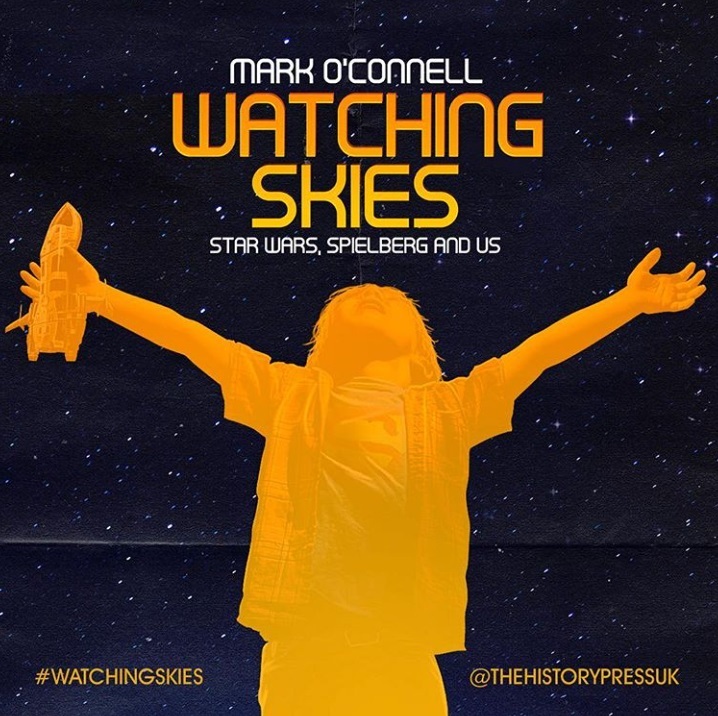 Watching Skies – Star Wars, Spielberg and Us is out to buy now and is published in the US in September. The work of Scott Woolston can be seen here and on his Instagram feed.